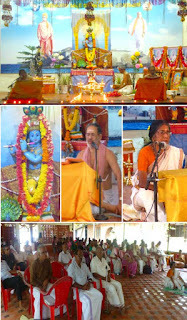 Bhagavatha Saptaham -Srimad Bhagavatha Saptaham started at Anandadham with Bhagavata Mahatmya on the evening of March Ist. Brahma Sri Madassery Neelakanthan Namboothiri was the Yagnaacharya. His Saha Acharya was his sister Sushree Haripriya and Kizhakizhum Narayanan Namboothiri as the poojari. The programme started with lighting of the lamp by the Acharya. Ma Lakshmididi honored the yagnacharya and others. Sreemad Bhagavatha Mahatmyam was read and the yagnya acharya gave a detailed explanation. The next day onwards for seven days it was reading and explanation of the different avatars of Sree Krishna. 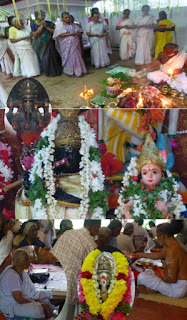 Ganapathi temple annual Pratishtha Divasam, celebration fell on the sixth day. Hence along with Bhagavatha reading, Ganapathi Homam and Sri Chakra Pooja was also performed. The whole programme concluded on 8th March with the distribution of yagna prasadam by the Yagnacharya. Dakshin pranta Sanghatak Sushree Radha Didi was present for the program during the last two days.